At this time, I’ve pulled honey and extracted it (and went on a 15 day hike in the mountains). But I had no time to blog when I did any of that that, so this blog is looking back about 10 days to when I pulled honey. 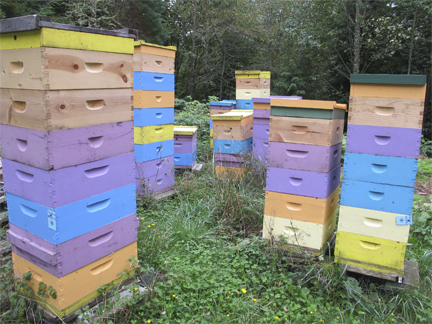 I run around 80 hives in Whatcom County, Washington (state). All my hives are in medium boxes, also known as “westerns”. One western full of honey weighs about 45 to 55 pounds. I can’t lift more than that, so westerns became the box of choice for me. I do not use queen excluders, so the queen and brood may be found anywhere, but usually in boxes 1 to 3. About half of my hives are “down river”, in the agricultural area. 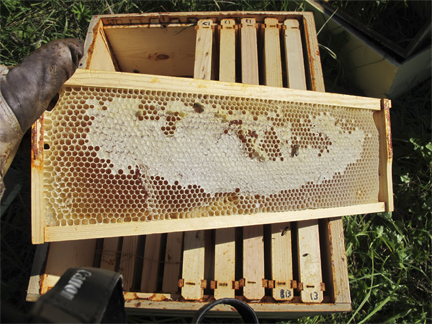 The hives from different farms produce Brookfield Farm’s “Farm and Field : Very Berry” honey. The area has raspberries, blueberries, and blackberries, plus the brassicas and other crops grown on Spring Frog Farm , the Carrot And Stick, as well as some yards of folks who live in the area. The other half of the hives are “up river”, in an area more known for forestry and logging: the foothills of Mt. Baker . 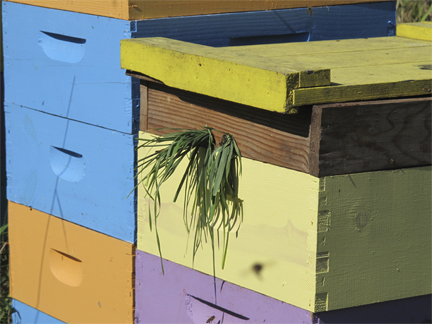 These hive produce the “Mountain Wildflower” honey. I tend to leave rather a lot of honey on the hives. I usually do not open the hives between October and March. Even that can be delayed if March is wet and/or snowy. It’s pretty here, but rather wet. In a way this makes pulling honey easier for me. I pull frames of honey until I reach the fourth box. I then check the fourth box to see that it has honey from frames 2 to 8. I have never had bees go to frames of honey in positions 1 and 10. Those positions may get an empty frame, or a partial frame, or honey. It depends on what I find in the hive. If the fourth box is honey-filled, I simply move on to the next hive. No sense disturbing the bees further. 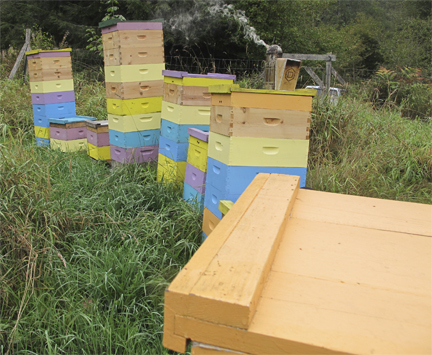 The third box will have brood and honey. The second box will have mainly brood. 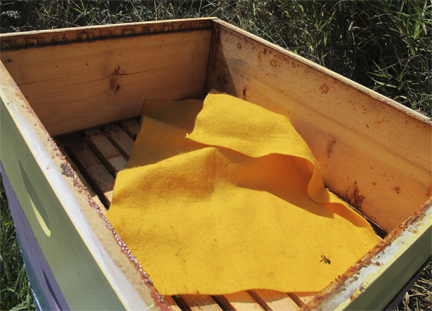 The first box will have pollen. Yep, I’ve been at this a while. If the fourth box has brood, I check the third box. If there’s only a frame of brood in the fourth box, and there’s room in the third box, I’ll move the brood down there. If there’s not, the hive gets a fifth box. This may seem extreme, but often my hives have quite a number of boxes on them. Some reach heights taller than I am (I’m 5 foot, 7 inches – about 1.6 meters). If you look close, you’ll see large hives going down to 4 or 5 boxes, and small hives rising to 3 or 4 boxes. 4 is my preference. But sometimes three is all they can achieve. 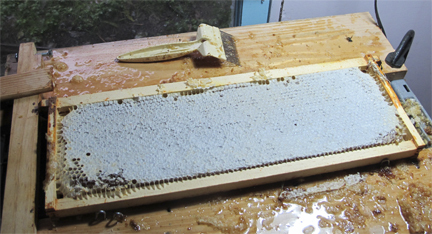 Some years I just shake and brush the bees off the frames as I pull the honey. 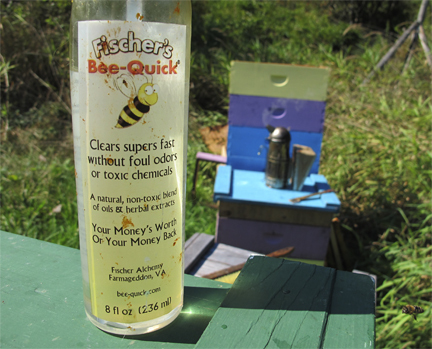 This year I decided to get a bottle of “Bee-Quick”, which I’ve used in the past. It worked well this year – possibly because we had such warm weather. It does not work that well for me when it’s cool and verging on rain (a normal occurance in my area). There are some formal ways to use this and other similar products, but I take a simpler approach. I spray it on a piece of thick felt, then leave it under the closed top for a few minutes. As I work my way down though the boxes, I just move the felt along with me. The smell is not too bad, but it would surly make me move away from it. I have learned this the hard way: by having it next to me in my truck as I travel between bee yards. I soon learned to put the rag in the back of the truck. I only pull fully capped honey. If it’s not capped, then it will be too wet. 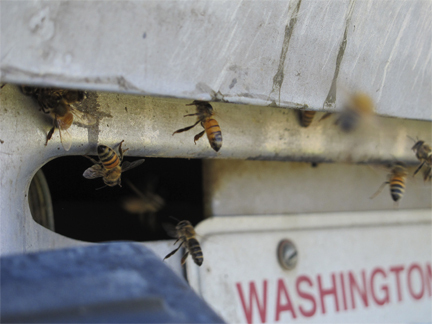 It must be an effort for the bees to dry nectar here – the whole area is damp. It can be frustrating when I pull a frame that looks perfect on one side, only to flip it over and see that the other side has yet to be capped. The frustration only lasts a moment because these frames are set aside during the pull, and returned to the hive if needed. If the partially capped frames are not needed, they are placed in the “donation” boxes. These frames will be given to smaller hives that I feel have potential to get though the winter, but have not put up enough stores (in my opinion). I know that makes some beekeepers’ skin crawl: the idea of putting a frame of honey from one box to another. Diseases and pests can spread that way. 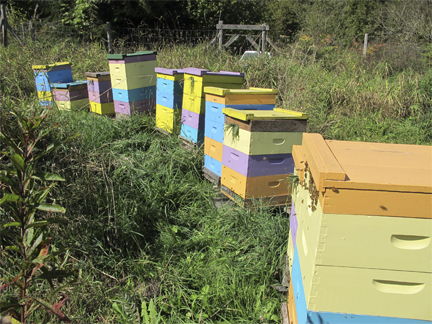 But I’ve had good luck doing it, and I figure the bees in each yard will be sharing those diseases and pests anyway – either though hive visits by drones, which are still flying in September, or by bees robbing. At any rate, adding frames to the smaller hives has worked for me, so far. 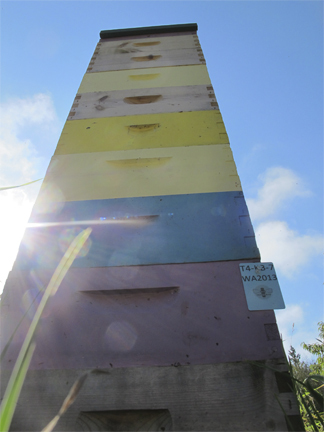 I have both strong established hives and newer, small hives side by side in most of my bee yards. Normally this is not an issue. But when I pull honey, I close down the lower entrance to a small gap and close the upper entrances for a few days. I figure this gives the guard bees a smaller area to patrol against bees from larger colonies who may try to rob the weaker hives. All the honey’s pulled now. I admit I do this slowly. It took me three and half long days to pull and balance all my hives. Happily those days were hot. It has never been so hot when I’ve pulled honey. It was 85F (about 30C), on one day. I had to keep going over to the shade of the farm’s fruit trees to cool down. The result was 35 boxes of honey loaded into my little pick-up truck and hauled into the extraction room. The bees took a special interest in my truck at this time. 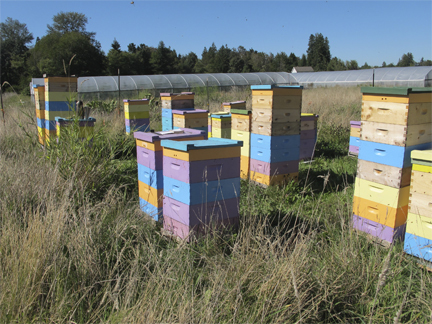 That’s the news from Brookfield Farm Bees And Honey, Maple Falls, Washington, for this week. I’ll write about the “exciting” extraction experience on the next blog. Oh heart be still. How did your honey harvest go? Or how is your spring, if you’re in the southern hemisphere? 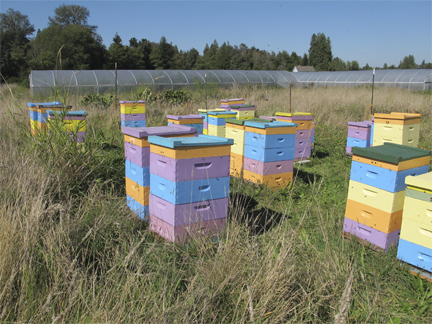 This entry was posted in Beekeeping, Brookfield Farm Bee Yards and tagged Beekeeping, Brookfield Farm, harvest, honey, Maple Falls, pulling, Washington. Bookmark the permalink.